Director Antoine Fuqua started his career off with a bang in 2001 with Training Day, a film in which Denzel Washington won Best Actor and Ethan Hawke was nominated for Best Supporting. Since then, Fuqua’s choices have gone from bad to worse, until his moderate success with Southpaw last year. With The Magnificent Seven, he looks to redeem himself, teaming up with Washington & Hawke once again in an effort to recapture the magic. Adding in Chris Pratt for good measure isn’t a bad idea either, since the hot-ticket actor is currently turning everything he touches into gold. But would those three great professionals be enough to resurrect an old franchise and kickstart a struggling director’s career? The answer lies within how those actors were used and what quality of scenery was woven around them to best let them shine. The answer, in short, is ‘no’. The small town of Rose Creek was once home to good, hard-working folk who were just trying to scrape a living in the dirt with their families & their pride. But then came Bart Bogue, owner of a local mining company and land baron extraordinaire. He wants to force the townspeople out of the area, scooping up all the land for himself, and will kill any who stand in his way. Recent widow, Emma Cullen, hires a bounty hunter named Chisolm to rid her beloved home of this evil villain, but Chisolm won’t be able to do it alone. He recruits a whole team of unsavory characters to help him fight: a cheeky gambler, a Southern sharpshooter, a beefy trapper, an Asian killing machine, a Mexican bandit, and savage red Indian. 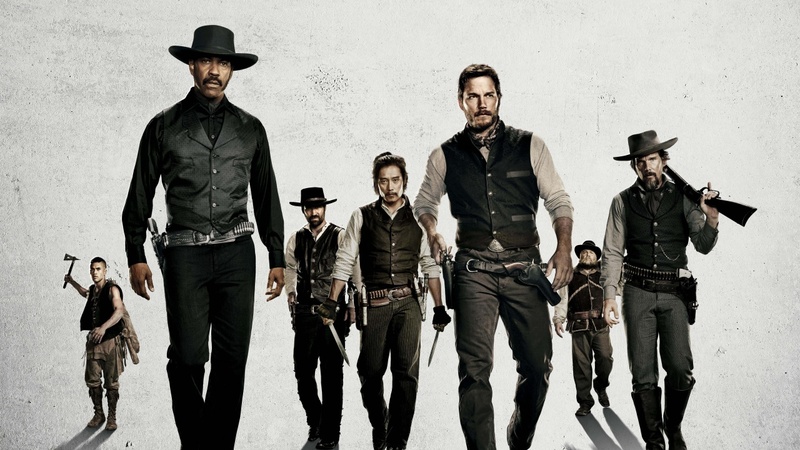 Together, this unlikely band of seven will fight for justice and peace, shooting men hither & thither along the way. Let’s start with the good, and to be honest, there wasn’t much. While Denzel is solid as the lead character with a hidden past and surprising melancholy, Chris Pratt steals the show. Without him the entire thing would have fallen to woeful pieces and become something rather unwatchable. His humor was mostly just right, except for a stupid scene in which he’s drunk for 10 seconds & for no reason. He insults the Mexican, supposedly starting a relationship that never really develops later in the movie except that they kinda become friends. But that wasn’t Pratt’s fault, and most of his work succeeds, from his crafty humor, simple jokes, and air of Joe Cool to the enjoyment that we all get from watching this former schlub turn into one of Hollywood’s most talented leading men. He’s here to stay, takes this entire film on his shoulders, and deserves basically all the credit for what went right. Now to what went wrong, and that’s pretty much all the rest of the film. I’ll start with the background chatter at the beginning of the film, which was stupidly detailed, just like a scene in Southpaw that I hated where boxes were being taken to storage. We don’t need to hear what workers are saying to see what the workers are doing, we’ll figure it out, thanks. Also, and this blows my mind, James Horner stole his own music from Enemy at the Gates and reused it here. I think he actually did the same thing in Avatar if I remember correctly, recycling the same dramatic lick to add tension. I caught you Jimmy, shame shame. Something else that was used too often was a shot sequence of all seven of their faces shown in a row. Fuqua must have have done that five or six times, dragging out every scene with a close up of every actor, like that was written into their contracts or something. Less is more, I say, and I could also have used less of Haley Bennett’s heaving bosom, as much as that bothers me to say, but it was just too often, too out of context, and too forced. She was really bad, as was her sidekick Luke Grimes. Peter Sarsgaard as the villain was fine, but not actually in the movie much. They spent too much time making every other moment & conversation last as long as possible, until the end result was two hours of too much mood, not enough quality action. In a way, Mag 7 was a lot like Lone Ranger, but much darker and without the fun; something to watch, I guess, but nothing to write home about.